Today you can hardly walk into a pharmacy, big box store or even a gas station without noticing some type of CBD product displayed in attention-grabbing areas of the store. Likewise, it’s hardpressed to find a news program or publication that doesn’t discuss the CBD craze spreading across the nation at least once a week. But what exactly is CBD oil and is it safe? 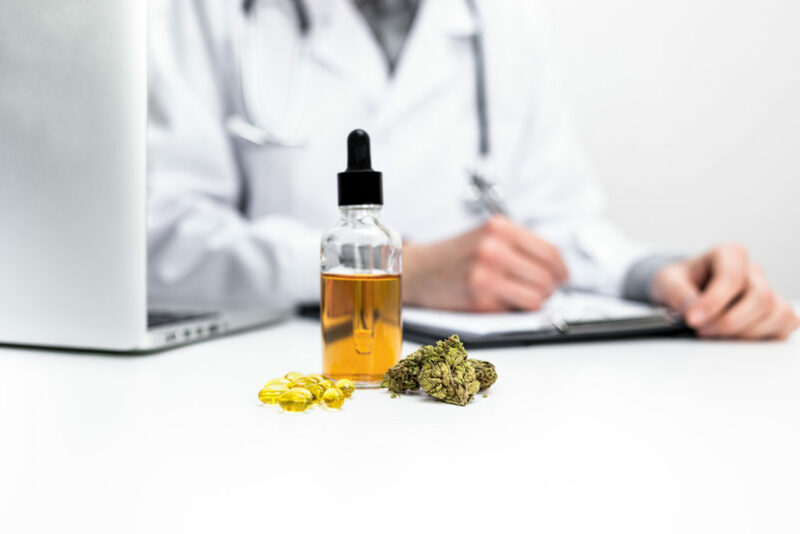 Read on to learn why you should talk with your medical provider before jumping aboard the CBD train. CBD stands for cannabidiol, a naturally occurring compound found in the cannabis plant believed to contain numerous health benefits. CBD oil contains little to no THC, the psychoactive compound found in the flowers and leaves of cannabis, the part of the plant known as marijuana. That means you can’t get high from using CBD oil unless THC has been added to the mix. Does CBD oil actually have any health benefits? So far, only one CBD oil product, Epidiolex, which was designed to treat certain rare epileptic syndromes in children, has been approved by the Food and Drug Administration. But many CBD proponents claim CBD oil has a multitude of health benefits ranging from relief from treatment side effects for cancer patients to easing symptoms of migraines and headaches, as well as anxiety, depression, and PTSD. Despite these claims, leading experts in CBD oil research warn that studies on the compound have so far been limited, thanks largely in part to tight restrictions by federal law. However, Dr. Esther Blessing, a top scientist and researcher in CBD oil testing who is currently performing a study to determine if the compound could work to treat PTSD patients with alcohol use disorder, told TIME that, so far, studies on the subject have been promising despite still being in early stages. Is CBD oil really safe to use? As we mentioned in the previous paragraph, research of CBD oil is still in its early stages, which means scientists do not yet know or understand the compound’s potential long-term side effects. Another concern surrounding CBD oil is the lack of regulation from the FDA on CBD products currently on the market. According to experts, CBD oil should only consist of the compound itself and one of two types of oils–hemp seed or coconut oil. The problem is without proper regulation, consumers simply can’t be assured that the product they are purchasing only consists of those ingredients. Recently, the FDA has cracked down on CBD oil companies who make unfounded claims in the marketing of their product, as well as on restaurants and food vendors who were offering CBD-laced items on their menus. Despite these concerns, CBD continues to gain momentum and more and more people are stepping out and defending their use of the compound with many claiming that CBD oil eliminated or greatly reduced ailment symptoms and improved their quality of life. If the lack of regulation and concerns of false advertising aren’t enough to convince you to consult with your medical provider before trying CBD oil, then our next concern should do the trick. Because of the lack of regulation on CBD products, there are concerns that some products may contain THC, the psychoactive compound in marijuana that gives users a “high” feeling. That compound could interact with other medications you may be taking. Your medical provider may also be able to recommend products that are widely accepted as trustworthy. If you or someone in your family is interested in trying CBD oil, we implore you to discuss it with your medical provider first. To schedule an appointment with one of our EliteCare providers, dial 662-348-3342.